Description: Sexes similar. Grayish-olive above, with wings being darker; white below, with pale yellow sides and flanks; two whitish wing bars; yellow spectacles. 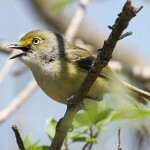 Distinctive white eyes are visible at close range. Juvenile is duller, with gray or brown eyes. 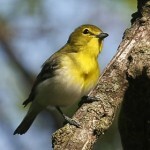 Habitat: Found among the dense understory of wooded bottomlands, and thickets near streams. 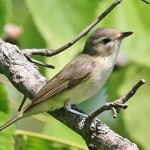 Where in Nebraska: Casual spring and fall migrant in the east, and a casual summer visitor, primarily in the southeast. 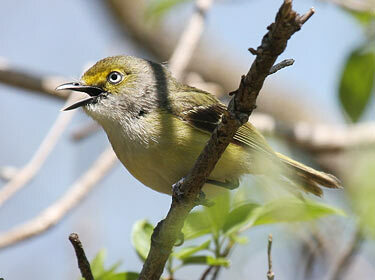 Fun Facts: White-eyed vireos do not bathe in shallow water but rather rub themselves against wet foliage.